Now here’s an idea. Why not write a book about quiet, reflective little nooks in one of Europe’s most vibrant and bustling little cities? What might sound like a dull excuse for a tourist guide, is actually an understated stroke of genius from an expat resident just looking for a spot of tranquility, in a tiny city with a reported four million visitors a year. 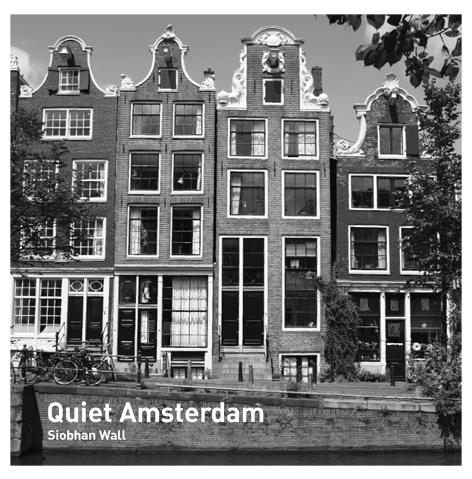 Siobhan Wall, author of Quiet Amsterdam, has penned an elegant little Baedeker inviting readers to seek out over one hundred idyllic and rarely-seen places, in and around Amsterdam. Although the chapters list all the usual tourist necessities such as restaurants, museums, parks and so on, each place has been specially chosen for its peaceful qualities. This is unlikely to be of much interest to first timers visiting the capital, who will want to see all the usual stuff you associate with Amsterdam, but for long-time residents and natives, this offers something unique, and a novel way to explore some interesting and little-known corners of the city. As with anything Dutch there are a few quirky inclusions, such as the Schipol Airport Meditation Room (free entry with any valid airline ticket once you get through the security checkpoint), and my personal favourite, Spa Zuider, where nakedness is strictly enforced everyday throughout the year, except on Tuesdays. Everywhere mentioned in this charming and delightful little book is within a 45 minute bus, tram or cycle ride from Centraal Station.